"This traditional salad is delicious, and you can vary the ingredients to your preference. Try adding diced, roasted chicken to make this salad a meal!" In a medium bowl, whisk together the mayonnaise, sugar, lemon juice, and salt. Stir in the apples, celery, walnuts, and raisins. Chill until ready to serve. 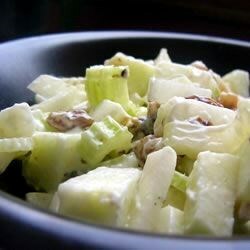 I have been searching for a GREAT Waldorf Salad recipe and I FOUND IT! I did omit the celery and reduce the mayo to 1/4 cup. Enjoy!